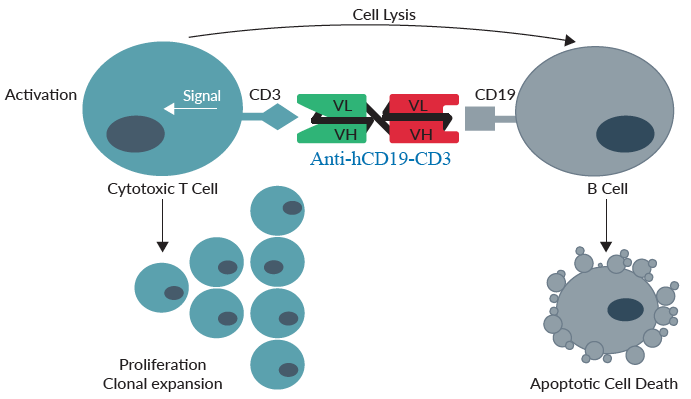 Anti-hCD19-CD3 is a bispecific antibody that recognizes two human cell markers: hCD19, which is expressed on the surface of B cells, and hCD3 which is part of the T cell receptor. This antibody features Blinatumomab single-chain variable fragments (scFv) joined by a glycine-serine linker. These two scFvs have been cloned from the anti-hCD19 (clone HD37) and anti-hCD3 (clone L2K-07) monoclonal antibodies [1,2]. Blinatumomab is used for the treatment of refractory acute lymphocytic leukemia (ALL) in clinics. By binding to hCD3 and hCD19, Blinatumomab engages unstimulated T cells to proliferate and exert cytotoxic activity on CD19-positive lymphoma cells . Blinatumomab does not cross‑react with CD3 and CD19 from mice, rats, or dogs . Anti-hCD19-CD3 bispecific antibody can be used for fine-tuning studies of B cell contact-dependent killing and T cell activation/proliferation. Negative control antibodies are also available from InvivoGen: Anti-hCD19-βGal and Anti-βGal-hCD3. 1. Krishnamurthy A. & Jimeno A., 2017. Bispecific antibodies for cancer therapy: A review. Pharmacol Ther. S0163-7258(17)30293-0. 2. Bargou R. et al., 2008. Tumor Regression in Cancer Patients by Very Low Doses of a T Cell– Engaging Antibody. Science. 321(5891):974-7. 3. Trivedi A. et al., 2017. Clinical Pharmacology and Translational Aspects of Bispecific Antibodies. Clin Transl Sci. 10(3):147-162. 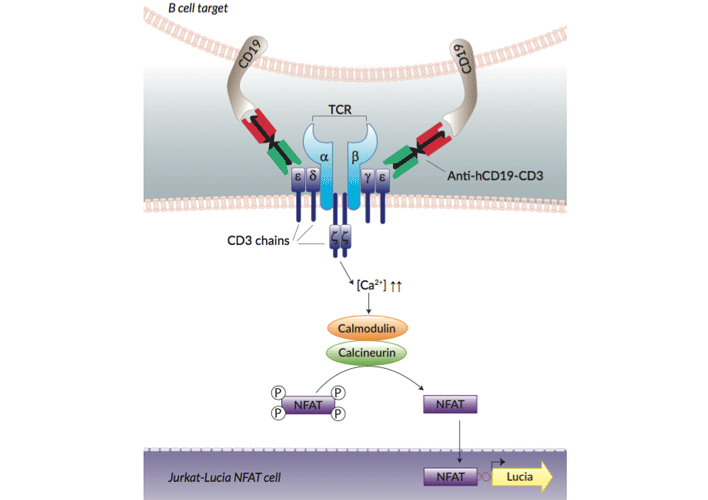 Jurkat-Lucia™ NFAT cell activation upon incubation with Raji B cells and Anti-hCD19-CD3. (A) Raji cells were pre-incubated with Anti-hCD19-CD3, or the two bispecific negative controls Anti-β-Gal-hCD3 and Anti-hCD19-β-Gal for 30 minutes before addition of Jurkat-Lucia™ NFAT cells. After 8 hours incubation, T cell activation was determined by measuring the Lucia luciferase activity using QUANTI-Luc™ detection reagent. Results are presented as relative activity expressed as a percentage of Lucia activity in samples with the highest dose of antibody. (B) Target specificity of Anti-hCD19-CD3 was verified upon incubation with Jurkat-Lucia™ NFAT cells and Raji cells as described in (A), with Jurkat-Lucia™ NFAT cells only, or with Raji cells only. T cell activation was determined by measuring the Lucia luciferase activity using QUANTI-Luc™ and expressed as relative light units (RLUs). Specificity: Targets cells expressing human CD19 and human CD3. Source: CHO (Chinese hamster ovary) cells. Purity: > 90% Purified by affinity chromatography. Binding to hCD19 and to hCD3 has been confirmed by flow cytometry. Biological activity has been confirmed using cellular assays. The complete sequence of this antibody has been verified. The absence of bacterial contamination (e.g. lipoproteins and endotoxins) has been confirmed using HEK-Blue™ TLR2 and HEK-Blue™ TLR4 cells. 10 µg Anti-hCD19-CD3, purified antibody, provided azide-free and lyophilized.